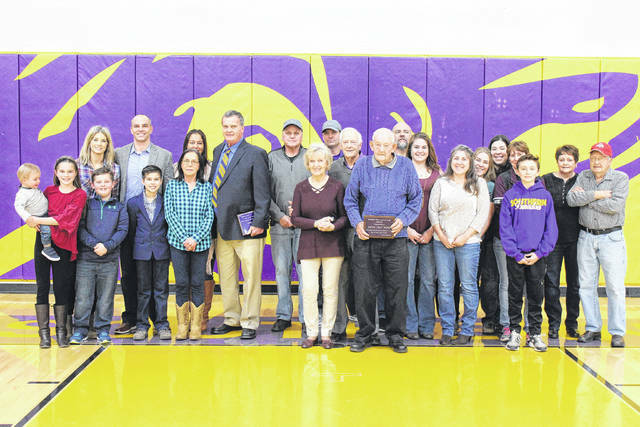 Hall of Fame Class of 2018 inductees Larry Price and Aaron Wolfe are pictured with family members during Friday’s induction ceremony at Southern High School. RACINE — Southern Local School District inducted its Class of 2018 during Friday evening’s basketball game. On Jan. 9, 2013 the Southern Local Board of Education unanimously voted to establish the Southern Local School District Hall of Fame. The purpose of the Southern Local School District Hall of Fame is to recognize Southern Local School District graduates, employees, and major contributors who have distinguished themselves by their individual contributions in scholarship, athletics, career, community service, and or society as a whole. Individuals can be nominated by anyone, but must be approved by the selection committee. The committee voted on and confirmed two candidates for this year — Aaron Wolfe and Larry Price. Wolfe was born in Letart Falls, Ohio in 1932. He was a very accomplished athlete in high school. He was a member of the Racine basketball team for three years, scoring 822 points which helped the team win three league titles. His teams achieved a combined record of 48 wins and 13 losses. He joined the United States Air Force in 1951 and served his country for fur years. He returned home in 1955 and continued to play baseball in the Ohio Valley Baseball League. These men played every weekend during the summer. He played for the Racine team until 1965. 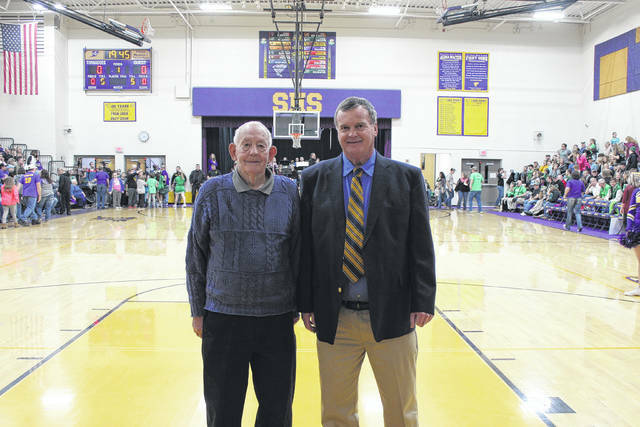 He coached the 7th and 8th grade basketball teams at Letart Grade School from 1958 to 1965. In 1965, he left Meigs County and moved to Middletown, Ohio to work for Armco Steel. He returned to Racine in 1970 and coached teams at Letart for three more years. He received no compensation for coaching and bought all the uniforms during this time. He also volunteered time officiating biddy league basketball for many years. He has always had a great love for Southern High School and Southern Athletics. He still attends most of the football, basketball, baseball, and softball games. Price was born in Portland, Ohio, in 1947, and is the son of Hubert and Carolyn Price. He attended Portland Grade School, where he participated in the Portland Invitation Tournament, (PIT). He scored 62 points in one game while at Portland. He was very active in Portland activities where he organized and coached the first Portland little league team. He attended Racine High school from 1961-1965 where he earned four letters in basketball and left with the school scoring record — 1,409 points. He made the first shot in the then “new gym,” and made a half-court shot in the same gym to end his career. He was also a part of two straight unbeaten regular seasons under Coach Mike Morrison and made all-state in his junior and senior years. His brother, Sam, also played at Racine and his sister, Beverly, was a cheerleader. He played on the first football team at Racine and was the first quarterback. In baseball, he pitched five no-hitters, and on three different occasions, struck out 21 batters in a seven inning game. He made all-state his senior year. He was drafted by the Washington Senators, but decided to play for Hall of Fame Coach Don Schaly at Marietta College, where he received four letters and led the nation in E.R.A. for most of his sophomore season. He received a B.A. in Education from Marietta College. He taught 39 years, mostly with Butler Tech in Hamilton, Ohio. Most of his time was teaching Career-Based Intervention. One of his greatest success stories was leading a program that helped at-risk students find successful lifestyles. He was honored as the Cincinnati Economic Teacher of the year in 1992. He is currently coaching baseball at Lebanon High School where he should obtain his 300th win this season. He has followed Southern Local Athletics over the years and is very proud to be a part of the Tornado fraternity. He has been married 42 years to his wife, Debbie and they have two children, Robbie and Natasha, and three grandchildren. Information provided by Southern Local. https://www.mydailysentinel.com/wp-content/uploads/sites/14/2018/02/web1_Southern-HOF-1201821210219347.jpgHall of Fame Class of 2018 inductees Larry Price and Aaron Wolfe are pictured with family members during Friday’s induction ceremony at Southern High School.